National Lighthouse Day - Point Arena Lighthouse Keepers, Inc. The Point Arena Lighthouse Celebrates National Lighthouse Day! 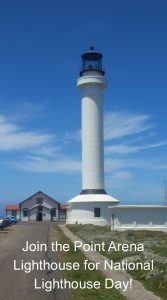 The Point Arena Lighthouse will celebrate National Lighthouse Day on Wednesday, August 7, 2019 from 10 a.m. to 4:30 p.m. All visitors will enjoy free admission to the Grounds, Museum and Tower Tours. Wind, weather and emergencies permitting, this great day will also feature a static display of a United States Coast Guard MH-65D Dolphin Rescue Helicopter! Guests can also purchase our famous homemade Light Keeper’s Strawberry Shortcake and home baked brownies. Barring an emergency call, the rescue helicopter will be on display at the Light Station helipad from 11 a.m. to 3 p.m. and visitors will be able to get up close and personal with the aircraft and even sit in the pilot’s seat. The flight crew will be available as part of their public affairs responsibility to explain how it all works. National Lighthouse Day was originally established in 1989 to “honor the beacon of light that, for hundreds of years, symbolized safety and security for ships and boats at sea,” according to the National Lighthouse Society. Point Arena Lighthouse joins hundreds of lighthouses across America on August 7 in celebrating the day by offering free admission and special events. More information is available by calling the Lighthouse at 877-725-4448, ext. 1 or 707-882-2809, ext 1. Observed annually on August 7, National Lighthouse Day honors the beacon of light that for hundreds of years symbolized safety and security for ships and boats at sea. At one time, the beacon of light could be found across almost all of America’s shorelines. A lighthouse is described as a tower, building or any other type of structure that is designed to emit light from a system of lamps and lenses and used as an aid to navigation for maritime pilots at sea or on inland waterways. Mark dangerous coastlines, hazardous shoals, reefs, safe entries to harbors. Have declined due to the expense of maintenance and replacement by modern electronic navigational systems. Has a source of light called a “lamp” (may be electric or oil fueled). Were originally lit by open fire and then candles. Differ depending on the location and purpose but have standard components. Has a lantern room which is a glassed-in housing at the top of a lighthouse tower. Has a Watch Room or Service Room beneath the lantern room. Has an open gallery outside the Watch Room or Lantern Room. Development accelerated in the 17th century with Britain’s Trinity House constructing its first in 1609. Earliest in North America was in St. Augustine, Florida. Printed on a 1791 map, it had been built by Menendez after his landing in 1586. America’s next lighthouse was Boston Light on Little Brewster Island in 1716. The oldest existing lighthouse in the United States is the Sandy Hook Lighthouse in New Jersey. Built in 1764, this lighthouse is still in operation. At the end of the 19th century, the United States had the most lighthouses of any nation. The 9th Act of the first Congress created the US Bureau of Lighthouses in 1789, which placed lighthouses under federal control. The United States Coast Guard took over on July 7, 1939. Visiting and photographing lighthouses has become a popular hobby as well as collecting ceramic replicas.